Shrink Trap is a container for changes. It is a small sound stage in which events are set in motion and recorded, and slight processes are given a new significance. Materials deform over time; through drying or the application of heat, twisting, curling, warping and leaving evidence as residual objects and as video and audio artifacts. This is an alchemical enterprise, or perhaps a pataphysical one. The colorful collection of cramped and crabbed creations suggests possibilities waiting to be unlocked, or some interior knowledge just out of reach. If Pataphysics is defined as “the science of imaginary solutions,” then Shrink Trap might well have been concocted by Alfred Jarry’s character Doctor Faustroll who presses the possibilities of matter to unearth the ineffable. 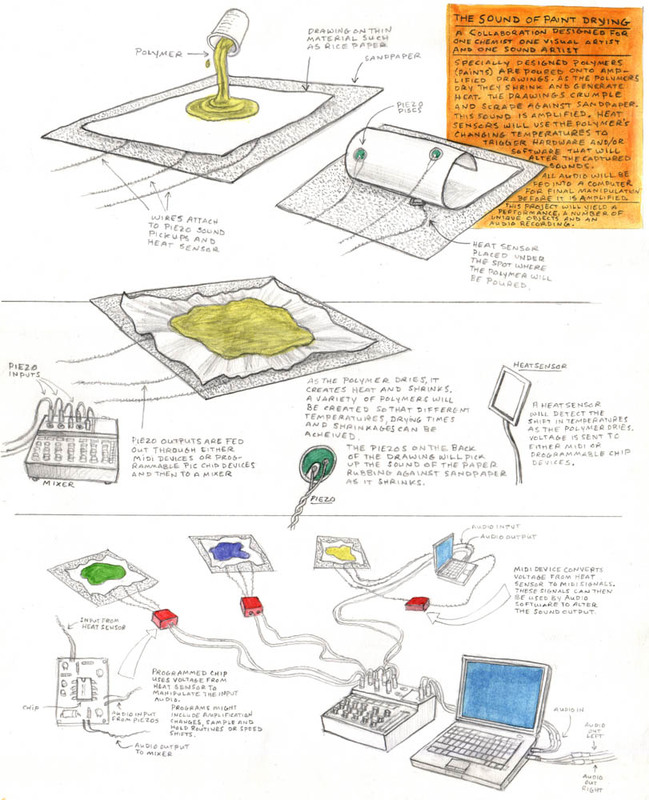 Shrink Trap has its origins in a sketch from 1997 for a performance (never realized) that utilizes the properties of shrinking polymer paint to create sound as well as a series of residual objects.